Ever since its rediscovery, relatively recent as it may be, theories and controversies, have swirled around the Sphinx. Perhaps this situation is not new, and the same occurred after previous rediscoveries, which were also followed by feverish attempts at repair and preservation, after which the desert once again claimed all but its enigmatic Sphinx head. 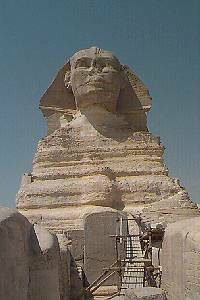 The real riddle of the Sphinx relates to its very identity. Everything that you may have learned in school or through mainstream educational programs is most likely erroneous. The people who have contributed to the status quo of the now stale and challenged "accepted theory" appear to be reluctant to accept new research. In some cases, those charged with protecting this precious leonine treasure actually deny access to researchers with whom they have had disagreements over theory. Finding reliable information on just what is going on is very difficult. When one does come across new information, s/he must wade through rumor, supposition, and, even more unfortunately, vitriolic back-biting. Edgar Cayce said, while in trance: that there were hidden areas below the Sphinx and that a Hall of Records that would be discovered near the end of this century. Educational television programs make it as boring as possible. Then, along came a few "new" researchers who had become faqscinated with the Sphinx. Thank heavens John Anthony West contacted Robert Schoch, a respected geologist, stratigrapher, and paleontologist. Professor Schoch has presented evidence that the Sphinx has been eroded by precipitation -- long periods of rains. Graham Hancock and Robert Bauval took this information and combined it with their own research and that of many others. The work that they've done, together and individually, is much too detailed to cover on a few pages of a web site. Their coauthored book, The Message of the Sphinx should be available in libraries by now. Graham Hancock and Robert Bauval seem to be the ones to turn to for honest reports on developments at Giza. Almost a century ago, P.D. Ouspensky wrote about his visit to the Sphinx. You may find that his down-to-earth yet mystical description explains a portion of the Sphinx's magnetic attraction. I hope you'll enjoy the reading selections and links provided below. Keep in mind that this is not the main page of the site. To see a table of contents, go to the main page of WOVOCA! This section will be continually updated as I come across new information.